With all our efforts failing when trying to find if such a cable exists as a products that you can order and get ready made to be installed we had to make one ourselves. Why would you need a cable like that anyway? With the abundance of SATA power connectors and just a few 4-pin Molex power connectors with all more recent power supplies you can end up with the need to have more 4-pin Molex power connectors, especially when building a mining rigs. Sure, you get plenty of SATA power to 4-pin Molex power adapter cable with the risers you buy for video cards, but they are all single SATA power and that is precisely the problem. Anything that requires a 4-pin Molex power connector can actually have a higher power usage than what a SATA power cable can supply in terms of maximal power rating. The result can be issues with stability and functionality due to overheating and melting SATA power cables due to higher load than what they are designed for. 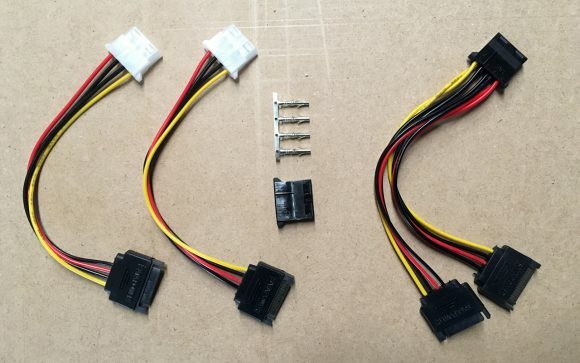 The solution is just to get a 4-pin Molex power connectors (Female ones) and turn two SATA power to 4-pin Molex power adapter cables into a single dual SATA power to 4-pion Molex power one. 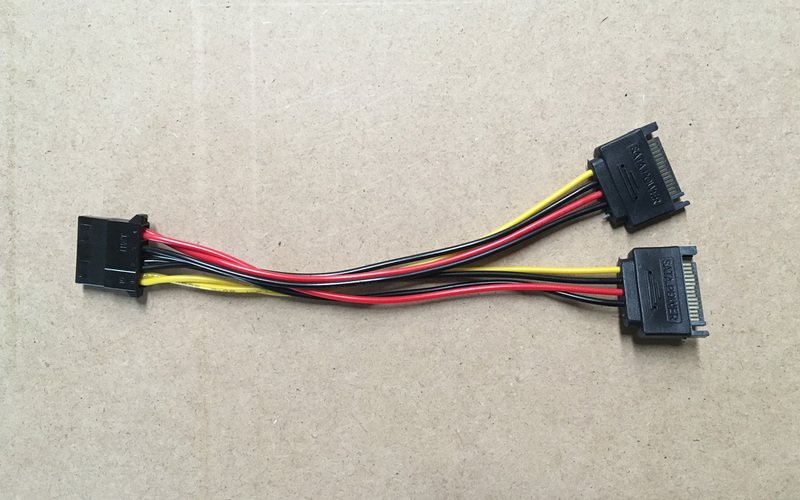 This way you can connect two SATA power cables from a single line for peripherals from the power supply to a single 4-pin Molex power and get completely safe with higher power draw components. Do note that you still need to be careful not to connect too much of these adapters to a single power line going to the PSU as you may overload the total capabilities of the cable and/or more likely the ones of the modular power connector that is used to connect the cable to the power supply. More than two dual SATA power to 4-pin Molex power cables on a single cable is not advised with 60W per power adapter cable max load just to be on the safe side, even if they are actually able to handle a bit more. Some more tips to help you stay on the safe side. Make sure that the peripheral power cables of your power supply are at last 18 AWG or lower number (thicker cables), so that they are able to handle more power. Typically good power supplies use 18 AWG cables for that and AWG 16 for the PCI-E power lines (especially if you have dual PCI-E power connector), but single PCI-E power connector per cable should be just fine with 18 AWG as well. When using two SATA power to 4-pin Molex power cable adapters for extenders make sure that they are also with 18 AWG cables, regardless if you build a dual SATA power cables like we do. There are some extenders that are being shipped with 20 AWG cables on these power adapters and this could cause even more serious issues if you try using them with higher power loads required, so try to avoid using these.